Nicole Richie & Her Family Celebrate A Friend's Birthday In LA! 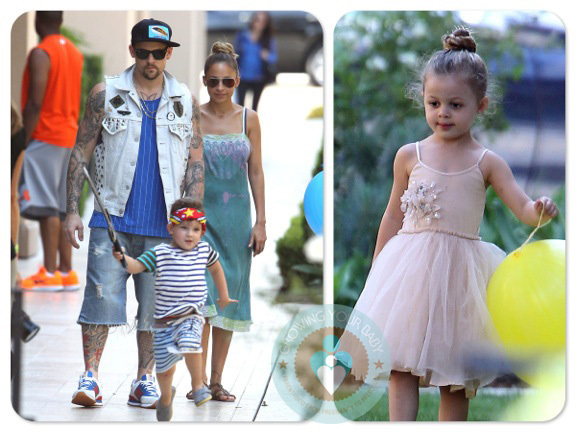 Home » Nicole Richie & Her Family Celebrate A Friend’s Birthday In LA! Nicole Richie & Her Family Celebrate A Friend’s Birthday In LA! Nicole Richie & Joel Madden were photographed on Sunday heading to a Birthday Party in LA with their kids Harlow and Sparrow in Beverly Hills, California. Harlow and Sparrow, came ready to party with Harlow dressed as a princess and her brother, a pirate, complete with a sword. Nicole and Joel took turns playing with the kids while the other took pictures. Joining them was Joel’s brother Benji and actor Tobey Maguire, his wife Jennifer Meyer, and their kids Ruby and Otis. Hilary Duff & Her Boys Shop At The Market!